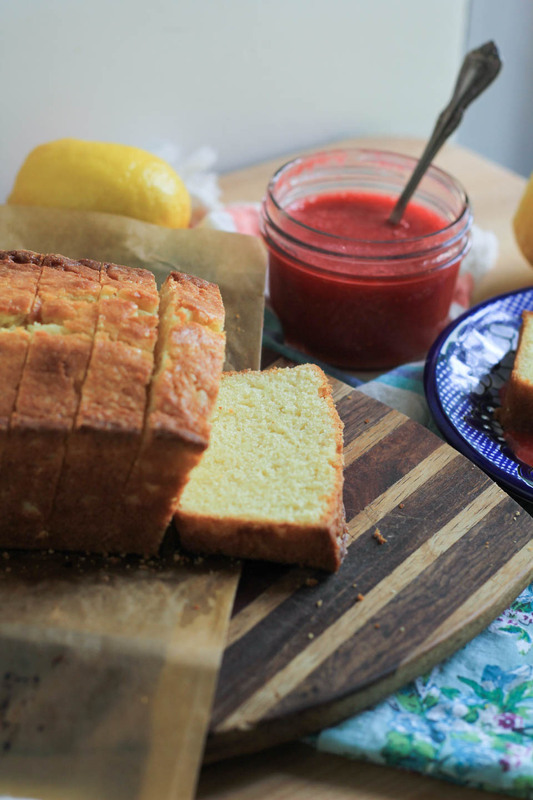 Fast forward to five years ago when I went to culinary school and worked in bakeries, making many of these Lemon Pound Cake with Raspberry Sauce simply because they are good and easy. If you notice most restaurants have very similar recipes for desserts and brunch sweets on the menu because of the prep time and space in the kitchen. Poundcake can be made months ahead, thawed and sliced for the day of service. And the sauce can be made within minutes at the start of the day. I just outed restaurants and bakeries :). Oops. But really, not all do this, but most do. Honestly though, where would we be if we didn’t have that restaurant trick? 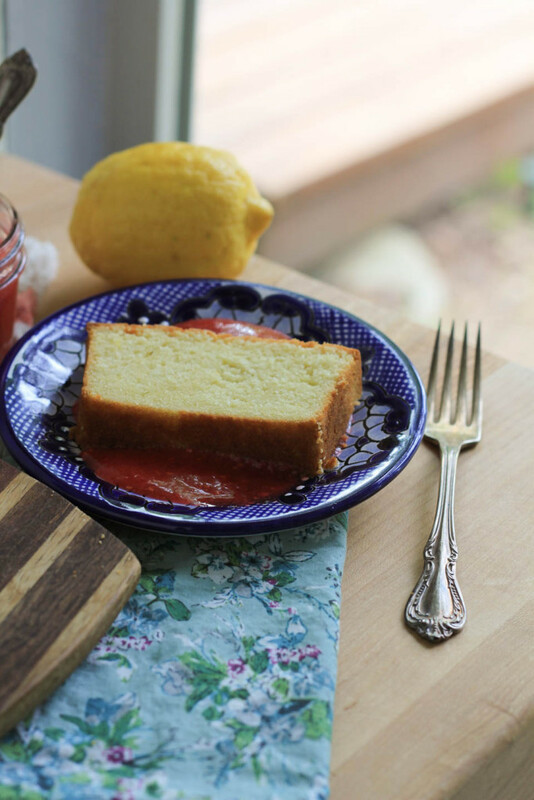 I would have never had the pleasure of enjoying the Lemon Pound Cake with Raspberry Sauce back in the day as a hostess in Sacramento, recalling that food memory to be able to share with you! Because it is so perfect for brunch, make it ahead of time for Mother’s Day, she’ll love you for it! I’ll be sharing this Lemon Pound Cake with Raspberry Sauce on ABC’s KATU Channel 2 Afternoon Live at 3pm. I’ll be including all the tips and tricks to a good pound cake! I alternately made a Honey Strawberry Greek yogurt spread for the show, either sauce is a beautiful pairing! Alternate Hone Strawberry Greek Yogurt Spread: mix 1 cup small chopped strawberries with 1/2 cup Greek yogurt, mix and taste. Then add 1/2 teaspoon honey until desired sweetness. Place oven rack in the bottom third of oven and preheat oven to 350 degrees. Line two 8×4-inch loaf pans with parchment and spray with cooking spray. Sift flour, salt, baking powder, and baking soda into a medium bowl. Whisk together buttermilk, lemon juice, zest, and extract in a measuring cup. Place butter and sugar in bowl of stand mixer fitted with paddle attachment or use a large bowl with hand mixer. Mix starting on medium for 30 seconds, then high for 5 minutes, or until light, fluffy, and smooth. Add 1 egg at a time on medium low speed, waiting for the egg to incorporate between each addition. Once all eggs are incorporated turn off mixer, scrape down the sides using a spatula. With mixer on low, alternating between the flour and buttermilk, add 1/3 of the flour first, followed by 1/3 buttermilk, ending with buttermilk. Gently scrape the side of the bowl using a spatula. Do not over mix. Divide batter between 2 loaf pans, place pans in oven and bake for 55 minutes, or until a toothpick comes out clean from the center of the loaf. Remove pans from oven and allow to cool 15 minutes before slicing and serving. Slice and serve with the raspberry sauce. Store loaf on counter for up to 3 days. For freezing, freeze the entire loaf wrapped in plastic wrap and in large ziplock bags for up to 3 months. To thaw, remove and thaw on counter overnight. Sauce: Place all ingredients in a blender or food processor, blend until smooth. Optional: pour through a strainer to remove seeds. Place in an airtight container, and store in fridge for up to 3 days. 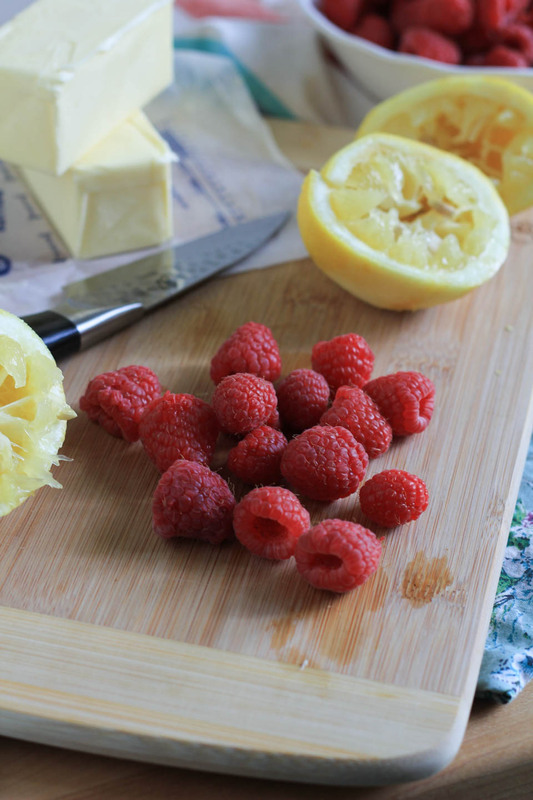 Ooooh yes, lemon and raspberries together makes the most delicious combination! 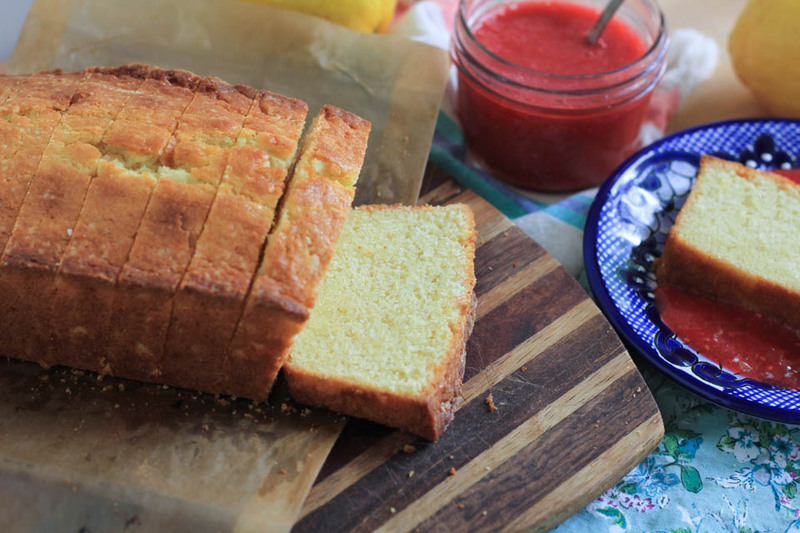 This pound cake looks like pure perfection! I wish I had a slice with my coffee now! 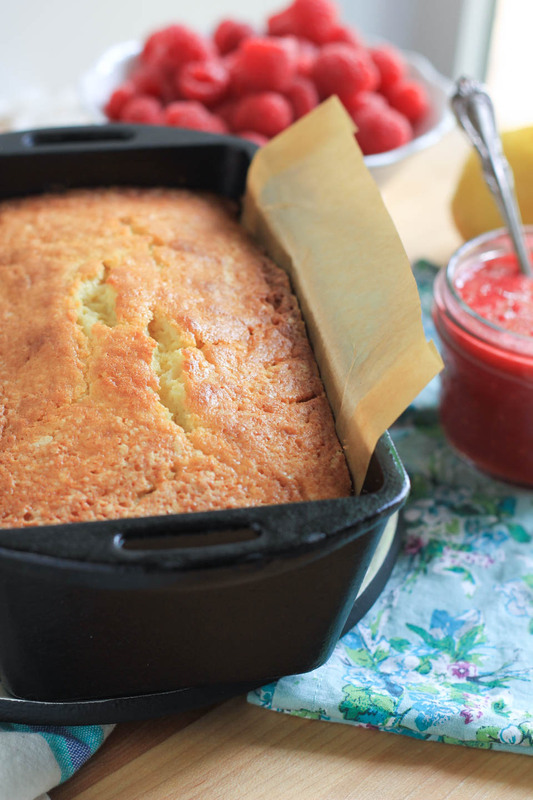 That pound cake looks absolutely perfect and I LOVE the lemon-raspberry combination! Love the combo, thank you! One of my very favorite cakes! I love the lemon and raspberry combo and actually shared a recipe making leftover lemon cake into mini trifles with cream and raspberries. Oh so good!